The Cardiac Rehab Program offers a medical evaluation to determine your needs and limitations. The medical staff uses this information to tailor a program for you and to help you set goals. The program provides counseling and education to help you understand your condition and how to manage it, along with counseling and education to help you develop healthier lifestyle habits, such as diet, stress management and smoking cessation. 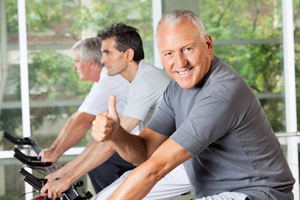 What are the benefits of attending cardiac rehab? Regular physical activity helps your heart (and the rest of your body) get stronger and work better. Physical activity improves your energy level and lifts your spirits. It also reduces your chances of future heart problems, including heart attack. Through education and exercise, you can lose weight, lower blood pressure and cholesterol levels, manage stress, and feel better about yourself. In addition, you'll have the added benefit of the advice and close supervision of healthcare professionals to help you along every step of the way. Talk to your doctor about whether prescribing Cardiac Rehabilitation is right for you. Sessions typically run three times a week (Monday, Wednesday, and Friday) for 12 weeks. A referral from your primary care physician or cardiologist is needed to begin the program. For more information, please contact: Theresa Ross, LPN @ 620-382-2177 x 134.